Your home is your sanctuary. A lot of us do not take the time out to really secure our living spaces which means we not only put ourselves in danger but our families too. Home security has become more than just about securing your home from burglars who want to steal what you worked hard to acquire, home security has become more personal and as such, it starts with the little things that we often take for granted like ensuring that the doors to our homes are secure. Most people cannot afford the 24-hour security company and the countless tech systems they always hailed as the best security and alarm systems. The fact that simply locking your doors is not good enough anymore. You need that technologically advanced security system in whatever for, it may come as. The good thing about technology is that it is scalable. You don’t always have to go big and install cameras or ward off wouId be intruders with signs like “these premises are protected by so and so security company” which deploys a two man army of armed guards whenever your alarm is tripped. Technology is scalable and just because it’s too expensive or complicated for you does not mean you should forego security altogether. You can start by securing your doors a little better with a smart lock. Of course, the industry already has a number of smart lock manufacturers who claim that their products are the best, but how do you as a newbie to smart locks know what constitutes the best? When in doubt, always look to the innovative industry leaders and in the realm of smart locks there are two brands: Schlage and Kwikset. So what is so special about these two systems and how do you choose one above the other? Here is a look at how these two systems compare to one another. Hopefully, this comparative review will help you decide the best one for your own home. Both these systems come with a standard keyhole. Kwikset smart locks have Bluetooth for better control. It also makes it easy access via your smart device. The control range of the Bluetooth connectivity is close to 30ft. Schlage uses Z-wave technology to connect. This means in order to connect and control your home’s entrances via your smart device or laptop, your device will have to be connected to this Z-wave through a Z-Wave hub and Z-wave app. The absence of such a hub means the lock itself has no app as the Kwikset system does. However, if you already have appliances connected to Z-Wave then you can control other things in the home. Smart locks do away with the need to have bunches of keys constantly getting lost or misplaced. Kwikset smart key system has a couple of lock and unlock options. One is the touch-to-open feature that allows to lock or unlock the front doorjust by touching the exterior part of the lock. However, if the smartphone is locked inside the house this touch-to-open key feature will not work. You can also create a timer for an automatic lock. The new generation of Kwikset smart locks can also be set on auto-lock which will lock the door, 30 seconds after the door has been closed. The Schlage Connect has its own lock and unlock options. You can unlock the door using a pin number. Unlike the Kwikset lock, you don’t need your smart phone or Bluetooth connectivity. You don’t have to rely on a key or a smartphone – just remember your pin code. It also has an auto-lock feature where you program the door to lock after a specific amount of time. The Schlage Connect smart lock has its own built-in keypad. The Kwikset systems have no keypad. You pretty much can’t run it without a smart device. The Kwikset smart locking system, allows users to create and share a maximum of 25 eKeys. There are different kinds of keys for different people, there is one for the owner, admin, scheduled, anytime and guests, etc. The Schlage with its keypad has the capacity to deal with 30 PIN codes. You can allocate the pins at your discretion. Security in the digital space or the net can be a problem. Devices aren’t just meant to be functional but secure as well. Kwikset uses multiple levels of military grade encryption and security software that could very well be the same used by the military to ensure complete security. When assessing the two in terms of quality and durability, Schlage is rated as being the best. It has an ANSI Grade 1 rating. It comes with a 90Db alarm which will give you alerts if your lock is being tampered with. Kwikset does not have this. Installation of a Smart lock can be a bit complicated. Of course, the Kwikset and Schlage connect are designed to be easy enough for DIY installations (if you know how to work a drill). Kwikset comes with an easy-to- follow instruction manual that explains the installation in detail. If you follow the steps outlined, you should have your lock installed and running in no time. Kwikset has a number of instructional videos on the net too if you need a visual demonstration of how to install a Kwikset smart lock key by yourself and they also have a great customer care service that can also help you do what you need to by taking you through the steps over the phone. Schlage also has its own do-it-yourself manual. It’s hard to follow guide that can confound a lot of technical people. There are also videos that can walk you through the installation process. Schlage also has great customer service. The design is an important aspect of smart lock systems. You still want a lock that will look good on your door. If you are looking at smart home technologies as scalable then this could mean you are moving from the traditional into the modern “techie” age. When it comes to aesthetic design, Kwikset locks can be described as beautiful. A lot of people who have installed, such locks love the round knobs and the glow the lock radiates. It has the aesthetic design that captures the attention and imagination of anyone who has come across it. Schlage, on the other hand, is more about functionality and quality, looks are secondary. The Kwikset and Schlage are both great smart keyless systems. They share similarities in certain areas, but each sits on a different level when it comes to features. People who love Kwiset, always mention how good it looks, however, Schlage users are more impressed with the quality of the built, it is designed to be practical but most of all, to last for a very long time. 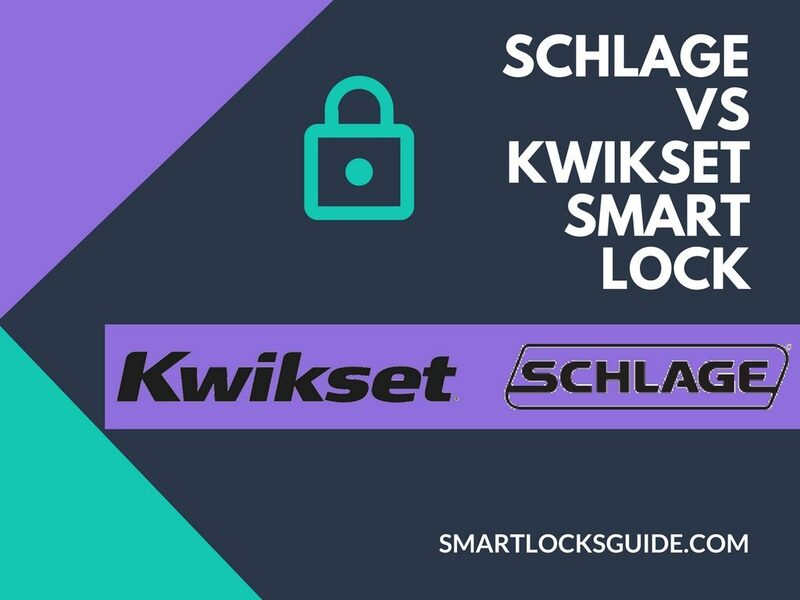 Hope this comparative review Schlage Connect vs Kwikset Kevo Smart Lock is helpful for you and not to forget, both these smart locks are available from the Amazon store online.